I like it when people think outside of the box and re-imagine basic techniques we’ve all come to rely on. 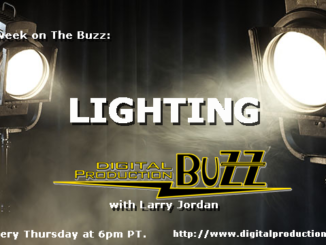 Take lighting gels, for instance. How many of you have used gaffer tape or some other type of adhesive to affix a gel on your lights, only have them melt off the adhesive and fall, get gooey adhesive all over the gel itself, or you actually rip the gel when taking them off? Well, here’s a nifty DIY trick that’ll keep the gel on, and make it easy to remove. The basic idea is to use magnets and binder clips to put the gel on your lights. The binder clips will serve as a platform to hold the magnet against the gel, and can be removed, stacked, or changed as needed to create the perfect look. However, since most lights are made out of aluminum, or some other lightweight metal, putting magnets against the light itself won’t always work. That’s where the folder binder clips come in handy. When you put on a binder clip and place it in the folded up position, you have a nice, steel platform to place your gel, and then put your magnet against it to hold it in place. No muss, no fuss. 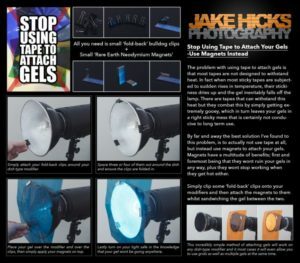 And if your magnet is strong enough, you can also put in some diffusion, or stack other gels in order to get just the right look. 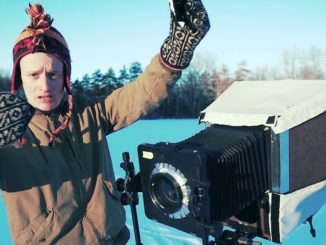 Jake Hicks, over at DIY Photography, recommends using “Rare Earth Neodymium Magnets,” as they are very powerful for their size. So strong that you practically have to pry them off, and they could pinch your fingers when you place them on because they attach fast and hard. The benefit of using magnets instead of tape is that you don’t end up with icky residue on your gel, which can limit their usable life, you don’t end up ripping them, and the method works with just about any size light or gel, so long as you can attach the binder clip to the end of your light. Jake uses 3cmx1cm Rare Earth Magnets, and they’re about a buck a piece when buying in a 20 pack on Amazon. Jake has found this method to be so simple, that even when he considered how he could profit from creating a product to accomplish the same goal, he couldn’t do it without over complicating the process. In the end, it’s just something he decided to share with the creative world. What a great DIY idea! 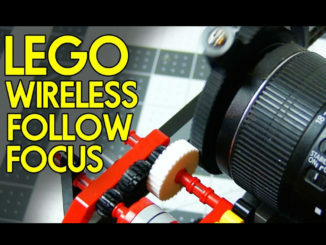 DIY: Build a Simple Wireless Follow Focus … with LEGOs?